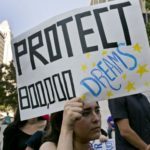 On September 5, 2017, Attorney General Jeff Sessions announced that the American Immigration Policy, Deferred Action for Childhood Arrivals (DACA), is being rescinded. DACA was founded by the Obama administration in June 2012. It allowed certain illegal immigrants who entered the country as children with their family to receive a two-year period of deferred action from deportation and eligibility for a work permit. Nearly 1 million of these youth were enrolled in the program by 2017, many of whom are prime Canadiates for Canadian immigration. The program does not provide lawful status or a path to citizenship, nor does it provide eligibility for federal welfare or student aid. However, the program brought hope, it allowed these youth, who grew up in America and have established their lives, to further contribute to the American economy. While the Trump administration spends their hours tackling policies established during the Obama administration, the Candian Government is strategizing to reach out and invite the same kind of individuals who were benefiting from DACA. These illegal youth who are heavily motivated, educated, and have integrated into western society are the kinds of candidates Canada searches for through the Express Entry program. Express Entry is an immigration management system developed by the Canadian government to help manage three immigration programs: Federal Skilled Workers, Federal Skilled Trades, and Canadian Experience Class. Through the Express Entry pool, candidates who are young, have completed a post-secondary education, have work experience, and are proficient in the English language are ideal candidates for Canadian immigration. Regardless of being an illegal immigrant, these individuals are eligible to apply through the Express Entry program and potentially immigrate to Canada. When an invitation is received, once processed through the Express Entry pool, the individual is invited to Canadian permanent residence. Permanent residence allows for them to work, apply for a drivers license, have access to health care, and can work their way to Canadian citizenship within 4 years.